In my latest post for The Knockturnal, I shared my recipe for chocolate-chunk-filled tahini almond squares. 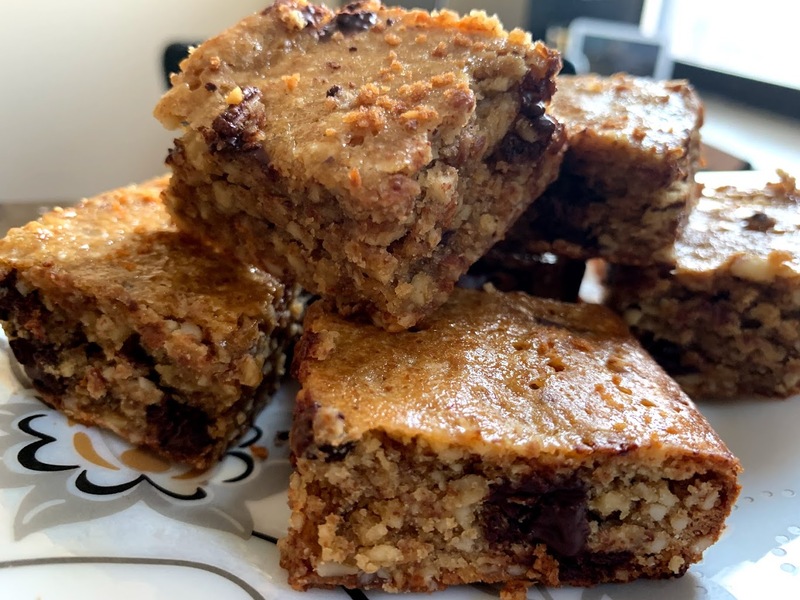 There is no flour or butter in these blondies, just finely ground almonds and tahini, a sesame paste used in Middle Eastern cooking. The flavors of almond and sesame may seem like a strange combination, but they work extremely well together, and are rich in healthy fats. But be warned: these blondies are extremely rich, so resist the temptation to eat the entire batch in one sitting! Preheat oven to 325 degrees F and grease a 10-inch square baking pan. In a large bowl, mix tahini and sugar together until light and fluffy. Stir in eggs, salt, and almond extract until smooth. Add finelt ground almonds and then chocolate chunks. Pour into prepared pan. Bake for 30-35 minutes, until edges begin to turn golden brown and a fork, toothpick, or cake tester inserted in the middle comes out clean or with a few crumbs. Store leftovers in an airtight container at room temperature.